So…I’ve been dying to tell you about this for months and it’s finally time to unveil my first shoe collaboration. That’s right; I’ve designed an actual real life shoe that you can buy and wear! The brand in question is the brilliant Jemima Vine, whose slip-ons I have loved since I first slipped my feet into a super-chic snake print pair about a year ago. They are some of the most comfortable shoes I have ever worn, so it was brilliant to do this project with a shoe I know and trust. 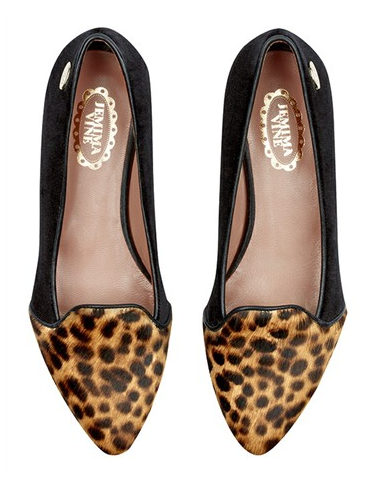 I worked closely with Jemima Vine’s founder, Jennifer Markham, to create a shoe that I thought you would all love too. While I do have a penchant for crazy prints and outlandish designs, what everyone – including me – wants most from a shoe is comfort (tick) and a colour or design that will go with everything in your wardrobe while standing the test of time. So leopard print pony skin was the absolute perfect choice as far as I was concerned. To add something a little bit different though, I wanted a two-tone effect too, so we made the back section of the shoe from black velvet. The end result is what I think is an ultra luxurious shoe, that looks as at home with a turned up pair of blue jeans and a Breton stripe as it does with an LBD. You could wear this to work (Jennifer started Jemima Vine because she couldn’t find the flat shoes she longed to wear to the office), to a wedding, or just down the pub on a Sunday afternoon. Whatever the occasion, or the outfit, I think you’ll really get people noticing your feet in these beauties! Of course, I wanted to add that extra special En Brogue touch to the collaboration, so every box comes adorned with one of my illustrations too. I really hope you like them! And if you do, you can buy them from January 20th from the Jemima Vine website (here). They are £159 and you can pre-order them now if you’re really keen! Even better than that though, we have one pair to give away. 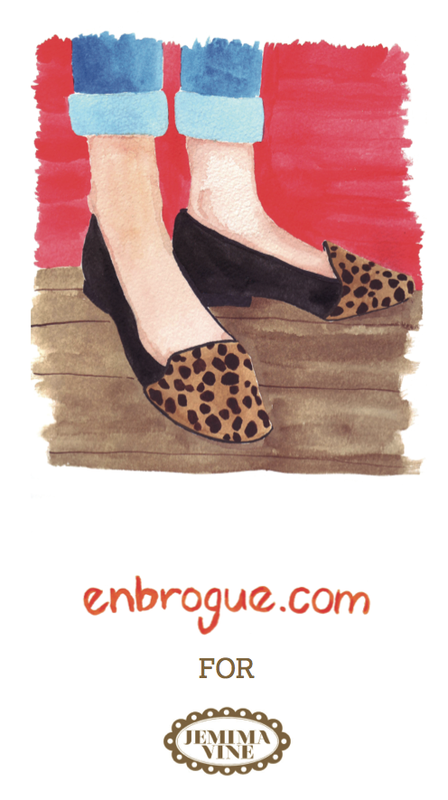 To be in with a chance of winning, simply tweet “I need @EnBrogue x @JemimaVine slippers in my life! 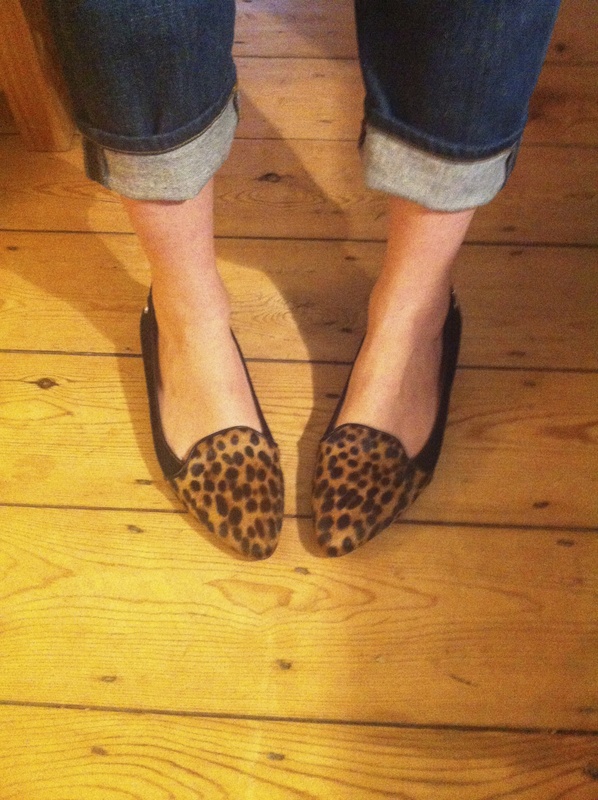 #leopardslippers” and like both the En Brogue and Jemima Vine Facebook pages. We will pick a winner at random and the closing date is the end of January. Good luck! Even more so on seeing they come in a 9 – totally beautiful, thanks for that! Oh my goodness, they’re so gorgeous! Competition officially entered!